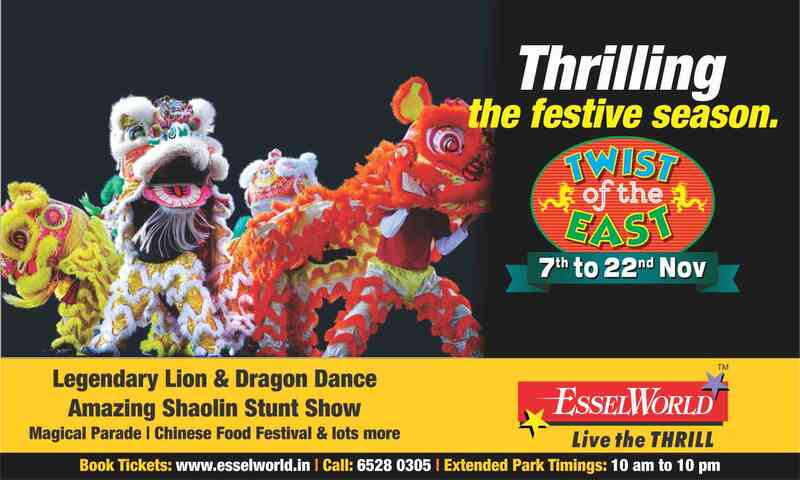 Get thrilled this festive season at EsselWorld with the dazzling carnival “Twist of the East” from 7th to 22nd November 2015. 22 International artists all the way from China will perform the Legendry Lion & Dragon Dance, Shaolin Monks Stunt Show and be part of the Magical Parade with EsselWorld’s Fab5 Mascots. Maharashtra Tourism Development Corporation has joined hands with EsselWorld for the Diwali carnival- Twist of the East. MTDC and EsselWorld are together doing many other activities to boost the tourism sector. To add festivity, the Chinese restaurant Taipan is hosting a Chinese food festival and has launched a special menu for this festive season.